Previous image, 25 total items. Next image, 25 total items. Leave the world behind and explore this immense forest reserve, which is carved by pristine rivers and speckled with alpine lakes and rugged peaks. The Okanogan-Wenatchee National Forest is comprised of over 4 million acres (1.6 million hectares) of pristine woodland across the eastern foothills of Washington’s Cascade Range. Bordered to the north by British Columbia, this vast tract of protected forest extends south toward the Stehekin and Lake Chelan valleys and incorporates varied terrain. Explore a network of hiking and biking trails or tackle wild rivers on a rafting adventure. Take advantage of the national forest’s collection of wheelchair-accessible lookouts. Start your trip to the Okanogan-Wenatchee National Forest with a visit to the Omak Visitor Center. Chat with staff or speak with the on-site ranger to learn about what you can do during your visit. Choose from a range of hiking trails, which include easy day walks and challenging multiday hikes. The Okanogan-Wenatchee National Forest has 8 miles (13 kilometers) of barrier-free trails and 1,285 miles (2,068 kilometers) of wilderness tracks. Popular trails include Boulder Trail, Echo Ridge and the Icicle Gorge Loop. Check out beautiful Rainy Lake or hike through the canyon that emerges out of Boulder Cave. In winter, traverse some of these trails with your snowshoes or cross-country skis. Some trails are accessible by wheelchair, ensuring easy use by visitors of all abilities. Visit the Washington Pass Observation Site to look out toward Liberty Bell Mountain, Early Winters Spires and Kangaroo Ridge. Ride through the forest on horseback or pick up the pace on a mountain bike. Rock climbing, fishing and gem-hunting are also popular activities in the forest. Stay overnight in the pristine environment by bunking in a cabin, pitching a tent or parking your RV. Select from more than 150 campgrounds and picnic areas spread across the national forest. The Black Pine Lake campgrounds include access to a boat launch and floating docks. There are ranger districts in Chelan, Cle Elum, Entiat, Winthrop, Naches, Tonasket and Leavenworth. The Okanogan-Wenatchee National Forest Headquarters is in Wenatchee and the visitor center is in Omak. Some sites are accessible only with a permit or by paying a fee. Check with your closest ranger office to find out more. Bring the kids to this fun-filled cottage where they can crush nutshells with wacky crackers and see how past generations opened nuts. Situated in Leavenworth, this vacation home is 5.2 mi (8.4 km) from Lake Wenatchee State Park and within 12 mi (20 km) of Kahler Glen Golf & Ski Resort and Plain Valley Nordic Trails. 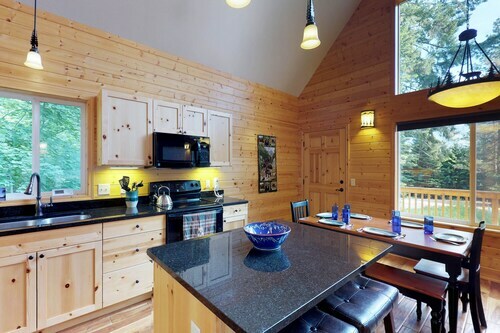 Situated in Leavenworth, this cabin is 0.1 mi (0.1 km) from Okanogan-Wenatchee National Forest and within 9 mi (15 km) of Cove Resort and Lake Wenatchee. Kahler Glen Golf & Ski Resort and Lake Wenatchee State Park are also within 9 mi (15 km). 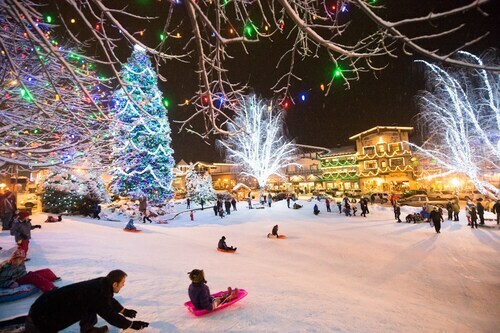 Situated in Leavenworth, this property is 0.1 mi (0.1 km) from Okanogan-Wenatchee National Forest and within 9 mi (15 km) of Cove Resort and Lake Wenatchee. Kahler Glen Golf & Ski Resort and Lake Wenatchee State Park are also within 9 mi (15 km). 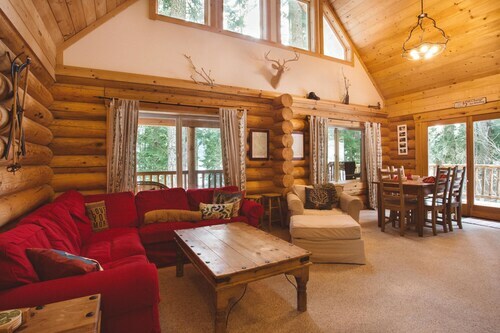 Situated in Leavenworth, this cabin is 0.1 mi (0.1 km) from Okanogan-Wenatchee National Forest and within 9 mi (15 km) of Lake Wenatchee State Park and Cove Resort. Lake Wenatchee and Kahler Glen Golf & Ski Resort are also within 9 mi (15 km). This Leavenworth vacation home is on the beach, 0.1 mi (0.1 km) from Okanogan-Wenatchee National Forest, and within 9 mi (15 km) of Cove Resort and Kahler Glen Golf & Ski Resort. Lake Wenatchee State Park and Lake Wenatchee are also within 9 mi (15 km). Situated in a rural location, this romantic property is 0.1 mi (0.1 km) from Okanogan-Wenatchee National Forest and within 9 mi (15 km) of Lake Wenatchee State Park and Cove Resort. Lake Wenatchee and Kahler Glen Golf & Ski Resort are also within 9 mi (15 km). Situated on a lake, this romantic property is 0.1 mi (0.1 km) from Okanogan-Wenatchee National Forest and within 6 mi (10 km) of Lake Wenatchee State Park and Cove Resort. Lake Wenatchee and Kahler Glen Golf & Ski Resort are also within 6 mi (10 km). Situated in Leavenworth, this vacation home is 0.1 mi (0.1 km) from Okanogan-Wenatchee National Forest and within 6 mi (10 km) of Lake Wenatchee State Park and Cove Resort. Lake Wenatchee and Kahler Glen Golf & Ski Resort are also within 9 mi (15 km).